It was 2002, and I landed an unpaid internship at a small, but prolific, production company in Hollywood. It was part of my transition from corporate America to the entertainment industry and I was paying my dues. The best part of the job was reading scripts; indulging in a writer’s visual imagination. I’d take ten scripts home over a weekend (called ‘the weekend read’) and return for Monday development meetings to render my opinion. I may not have been being paid, but they listened to my creative opinion, which was pretty cool. One script in development was a new twist on the “creature feature” – a low budget monster movie – showcasing a monster I’d never heard of before: El Chupacabra. The Chupacabra is a Latin American monster, a goat-sucking (literal translation) type of hairless beast that’s supposedly lizard-like and the size of a small bear. It’s become a modern legend in Mexico (though it started in Puerto Rico) and it’s sometimes used to explain the strange death of cattle and goats (though diseased coyotes are the realculprits). Flash forward ten years later as I was crafting ‘Memoirs of a Neurotic Zombie’, living in the shadow of Twilight’s vampires vs. werewolves shadow, I decided that we needed a diverse monster. Having lived in America for about seven years, I came to understand how closely linked the country is with Mexico, and how waves of (both legal and illegal) immigrants have shaped the country. One of my best friends grew up as a boy as an illegal immigrant and became legal under Regan’s amnesty – he’s culturally Mexican in many ways but also proudly American. It’s a fascinating complexity to explore. So in setting Neurotic Zombie in Adam Meltzer’s hometown of Croxton, Ohio (a fictional version of Oxford, Ohio), it seemed right to introduce a family of Mexican-Americans. Of course, since I was writing a story about a zombie with OCD who’s crushing on a vegan vampire, I’d give Ernesto Ortega a double-life as a destructive,blood-thirsty (he prefers squirrels) Chupacabra. ‘One horrific howling was coming from the back yard. I bolted upright, my bones creaking and cartilage complaining, and stared out the basement window that overlooked the lawn. I couldn’t believe my dead eyes. It was my neighbour Ernesto Ortega, hunched over, ready to hurl. He was about to fertilise Mom’s tulips with the contents of his stomach. Normally the sight of vomit would keep me inside, behind locked doors, but I knew Mom was very sensitive about her flower beds – her ‘islands of calm’. Ever since someneighbourhood dog had started trashing them, her soothing hobby had become a source of stress. I felt honour-bound to defend them. He looked up at me and screamed. It was hardly a fair reaction. I should have been the one doing the screaming since he was the real monster. My first thought, given the full moon, was obviously werewolf, but Nesto looked more like a fusion of a lizard and an underfed gorilla. ‘Bless you,’ I said, retaining my manners; even though he didn’t bother to cover his mouth with his claw. ‘No, Chup-a-ca-bra,’ Nesto enunciated, before letting out another painful screech as his face elongated. He sprouted two giant incisors like a scaly sabre-toothed tiger and foamed at the mouth. He convulsed again as his eyes swelled into black ping-pong balls. His face scaled over and he looked like Jake’s pet iguana. I think it’s time for a new monster in our pop-culture menagerie; a creature offering a bit more diversity than we get from sparkling white vampires or hunky werewolves. Stand proud El Chupacabra, your time has come! 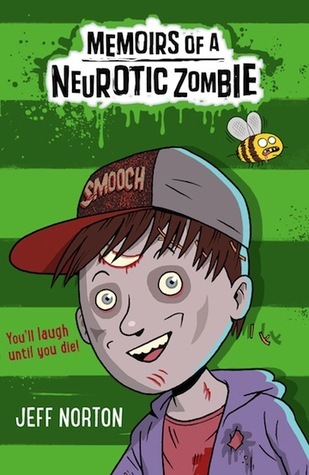 Jeff Norton’s ‘Memoirs of a Neurotic Zombie’ publishes from Faber on 7th August. Jeff is on the web at www.jeffnorton.com and tweeting as @thejeffnorton.